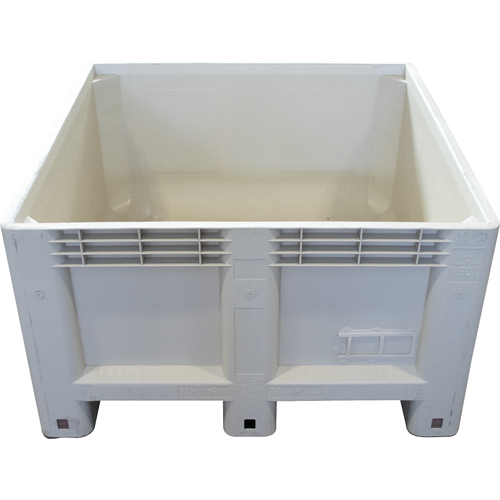 The most popular bin in the wine industry for picking and fermenting. Made from injection molded, high-density food-grade plastic, they are built to withstand forklifting. Holds a half-ton of whole grapes or approximately a ton of crushed fruit. Because they have an internal flat bottom, smooth curved hygienic surfaces, and a great geometry, they are often used as an inexpensive primary fermenter. They work well for this application because they offer good heat dispersal and skin contact. 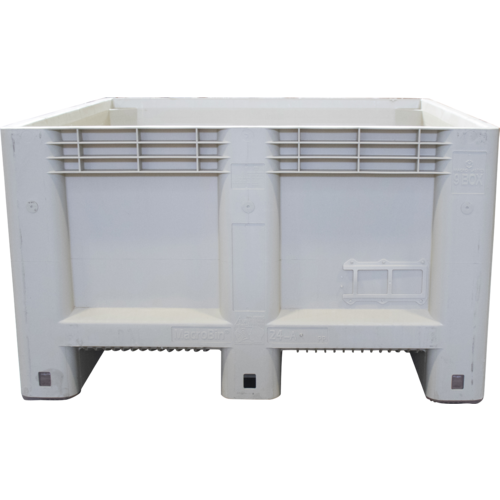 If cooling is necessary consider one of our cooling plates that can be placed horizontally in the bin to give temporary relief from high temperatures. These will hold about 180 gallons of liquid and have a functional capacity of about 135 gallons of fermenting must, allowing for cap development. What is the fill line for liquid in the macro bin? BEST ANSWER: Hello Edith - These will hold about 180 gallons of liquid and have a functional capacity of about 135 gallons of fermenting must, allowing for cap development. From bottom to rim is about 22.5 Inches.